Home › Antique Led Bulb Oak Leaf 4W St64 Vintage Edison Dimmable Light Bulb Led Ligh.. Antique Led Bulb Oak Leaf 4W St64 Vintage Edison Dimmable Light Bulb Led Ligh..
Quality Material: Made of Premium material, the Oak Leaf Antique LED bulb is a piece of cool gear to decorate your house in special days. With fine outer glass, this bulb is durable for use, smash and crash proof. Multi-Function: This Oak Leaf Vintage Look LED Bulb is ideal for outdoor lanterns, ceiling fixtures, chandeliers and pendants, multiple places you'd like to decorate with. Lifespan: The Oak Leaf Antique LED Light is 4w, 330 lumens, 80 CRI, 30,000 hours average rated life, Medium (E27/E26) Base. One bulb for a dozen years of use, as long as you don't break it. Warranty: Oak Leaf is always standing back for its products. Whatever problems of the product, please feel free to contact us, we will get it settled ASAP. 1 Year warranty for all customers. Size: 6-Pack Description: FOR DECORATION: Add a vintage touch to your house or garden with this Oak Leaf decoration bulb. Though the bulb is vintage look designed, the lighting is modern. With LED lighting inside, the bulb is power conservation and long lasting durability. If you want to decorate your house in a vintage way but keep eco-friendly, then this is the best choice. 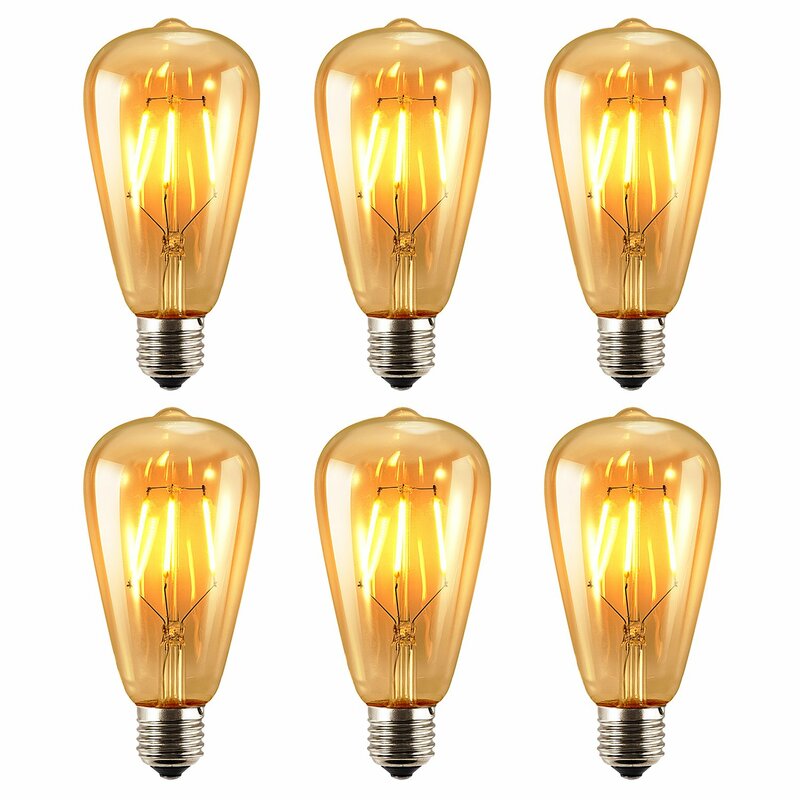 Despite indoor lighting, it is also perfect for lanterns, ceilings, trees orother exposed bulb application, adding a warm glow to any vintage,contemporary or steampunk decor. PROTECT YOUR EYES:This Oak Leaf Edison LED Light Bulb emits soft tender white light to well protect your eyes. LONG LIFESPAN: Meanwhile with a lifespan of over 30,000 hours, it saves you the money to replace and do you another way of contribution to the environmental conservation. Specification: Size: 5.9" H x 2.5" D /15064mm Recommended Appliance: Decorative Brightness: 330 Lumens Bulb Type: Tubular Bulb Base Size: Standard Screw Light Appearance: 2700 kelvin Watt Output Equivalent: 4w Volts Required: 110V Lifespan: 30,000 hours Socket: E26/E27 Take this bulb home for your special days decoration or simply lighting forthe places you want. Oak Leaf production, quality guaranteed.